Ram Nath Kovind on 25 July took oath and was sworn in as the 14th President of India. Before the swearing-in ceremony, President Ram Nath Kovind along with his wife Savita Kovind paid tribute to the Father of the Nation Mahatma Gandhi at Rajghat. 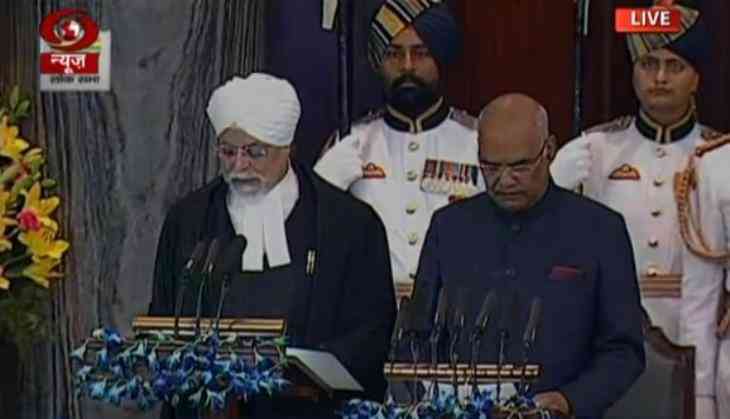 The Rashtrapati Bhavan Twitter handle now showed Kovind as President as said in its inaugural tweet, "Honoured to be sworn in as the 14th President of India; would be carrying out my responsibilities with all humility #PresidentKovind"
Here's the full text of Kovind's maiden speech as president. I thank you for electing me to the responsibility of the President of India, and I enter this office with all humility. Coming here to Central Hall has brought back so many memories. I have been a Member of Parliament and here, in this very Central Hall, have had discussions with many of you. Often we agreed, sometimes we disagreed. But we learnt to respect each other. And that is the beauty of democracy. I grew up in a mud house, in a small village. My journey has been a long one, and yet this journey is hardly mine alone. It is so telling of our nation and our society also. For all its problems, it follows that basic mantra given to us in the Preamble to the Constitution – of ensuring Justice, Liberty, Equality and Fraternity and I will always continue to follow this basic mantra. I bow to the 125 crore citizens of this great nation and promise to stay true to the trust they have bestowed on me. I am conscious I am following in the footsteps of stalwarts such as Dr. Rajendra Prasad, Dr. S. Radhakrishnan, Dr. A. P. J. Abdul Kalam, and my immediate predecessor, Shri Pranab Mukherjee, whom we address out of affection as ‘Pranab Da’. Our Independence was the result of efforts by thousands of patriotic freedom fighters led by Mahatma Gandhi. Later, Sardar Patel integrated our nation. Principal architect of our Constitution Babasaheb Bhim Rao Ambedkar instilled in us the value of human dignity and of the republican ethic. These leaders did not believe that simply political freedom was enough. For them, it was crucial to also achieve economic and social freedom for millions of our people. We would be completing 70 years of our Independence soon. We are also well into the second decade of the 21st century, a century that so many of us intuitively believe will be an Indian century, guided and shaped by India and its accomplishments. We need to build an India that is an economic leader as well as a moral exemplar. For us, those two touchstones can never be separate. They are and must forever be linked. The key to India’s success is its diversity. Our diversity is the core that makes us so unique. In this land we find a mix of states and regions, religions, languages, cultures, lifestyles and much more. We are so different and yet so similar and united. The India of the 21st century will be one that is in conformity with our ancient values as well as compliant with the Fourth Industrial Revolution. There is no dichotomy there, no question of choice. We must combine tradition and technology, the wisdom of an age-old Bharat and the science of a contemporary India. As the gram panchayat must determine our consultative and community based problem solving, the Digital Republic must help us leapfrog developmental milestones. These are the twin pillars of our national endeavour. — We take pride in the little things we do every day. Each citizen of India is a nation builder. Each one of us is a custodian of India’s well-being and of the legacy that we will pass on to coming generations. — The armed forces that protect our borders and keep us safe are nation builders. — Those police and paramilitary forces that fight terrorism and crime are nation builders. — That farmer toiling in the blazing sun to feed fellow citizens is a nation builder. And we must never forget that so much of our farm labour comprises women. — That scientist concentrating tirelessly and 24 x 7 to send an Indian space mission to Mars, or invent a vaccine, is a nation builder. — That nurse or doctor helping the sick to recover and fighting disease in a remote village, is a nation builder. — That young person who founds a start-up and becomes a job creator is a nation builder. The start-up could be on a small farm, converting mangoes to pickles. Or in an artisans’ village, weaving carpets. Or at a laboratory lit up by giant screens. — That tribal and ordinary citizen striving to preserve our ecology, our forests, our wildlife, to push back climate change and to advance the cause of renewable energy, is a nation builder. — That committed and driven public servant who works beyond the call of duty, whether on a flooded road, directing traffic; or in a quiet room, poring over detailed files, is a nation builder. — That self-less teacher who equips young children and shapes their destinies, is a nation builder. — Those countless women who take care of families with so many other responsibilities, at home and work, and raise children to become ideal citizens, are nation builders. People elect their representatives from the Gram Panchayat to Parliament. They vest their will and hopes in these representatives. In turn, the people’s representatives devote their lives to the service of nation. But, our endeavours are not for ourselves alone. Down the ages, India has believed in the philosophy of Vasudhaiva Kutumbakam (वसुधैव कुटुंबकम) – the World is My Family. It is appropriate that the land of Lord Buddha should lead the world in its search for peace, tranquility and ecological balance. India’s voice counts in today’s world. The entire planet is drawn to Indian culture and soft power. The global community looks to us for solutions to international problems – whether terrorism, money laundering or climate change. In a globalised world, our responsibilities are also global. This links us to our global family, our friends and partners abroad, and our diaspora, that contributes in so many ways across the world. It brings us to the support of other nations, whether by extending the umbrella of the International Solar Alliance or being first responders following natural disasters. We have achieved a lot as a nation, but the effort to do more, to do better and to do faster should be relentless. This is especially so as we approach the 75th Year of our independence in 2022. What must also bother us is our ability to enhance access and opportunity for the last person and the last girl-child from an under-privileged family if I may put it so, in the last house in the last village. This must include a quick and affordable justice delivery system in all judicial forums. The citizens of this country are the real source of strength to me. I am confident that they will continue to give me the energy to serve the nation. We need to sculpt a robust, high growth economy, an educated, ethical and shared community, and an egalitarian society, as envisioned by Mahatma Gandhi and Deen Dayal Upadhyay ji. These are integral to our sense of humanism. This is the India of our dreams, an India that will provide equality of opportunities. This will be the India of the 21st century.